, a miscellaneous writer and translator of the last century, was a native of Ireland, who merits some notice, although we have not been able to recover many particulars of his history. He appears to | have resided the greater part of his life in London, and employed his pen on various works for the booksellers, principally translations. In 1765 he received the degree of LL. D. from the university of Aberdeen. He died at his apartments in Gray’s Inn, April 27, 1772, with the character of a man of learning, industry, and contented temper. The first of his translations which we have met with, was that of Burlamaqui’s “Principles of Politic Law,” 1752, 8vo. 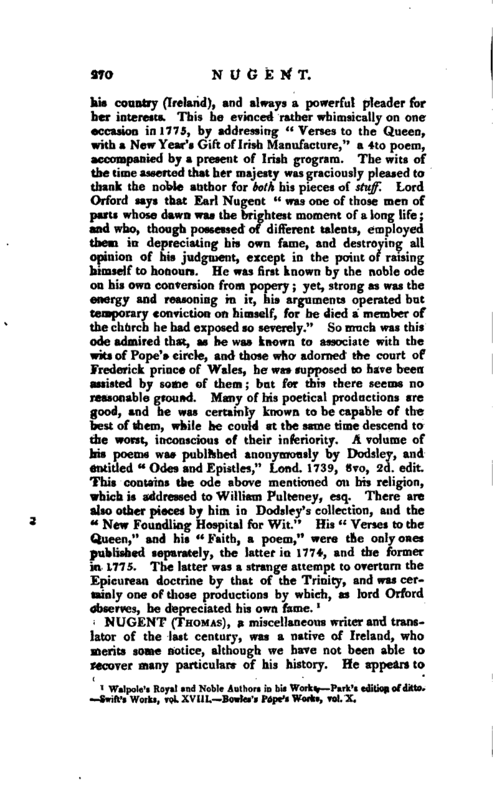 This was followed by the abbe de Condillac’s “Essay on the origin of Human Knowledge,” 1756, 8vo. Macquer’s “Chronological abridgment of the Roman History,” 1759, 8vo; and Henault’s “Chronological abridgment of the History of France,” 1762, 2 vols. 8vo. In 1766 he travelled on the continent for the purpose of collecting materials for his “History of Vandalia,” which he completed in 3 vols. 4to, in 1776. This tour also occasioned his publishing “Travels through Germany,” &c. 2 vols. 8vo. 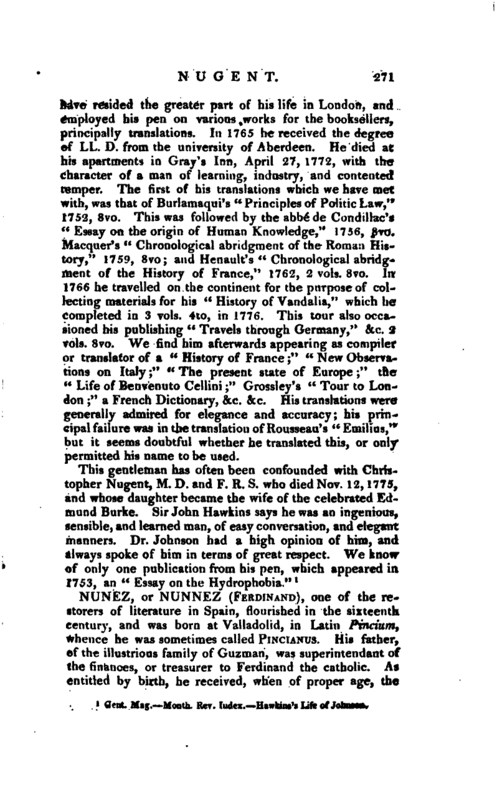 We find him afterwards appearing as compiler or translator of a “Historyof France” “New Observations on Italy;” “The present state of Europe;” the “Life of Benv^nuto Cellini” Grossley’s “Tour to London” a French Dictionary, &c. &c. His translations were generally admired for elegance and accuracy; his principal faifure was in tjr^translation of Rousseau' “Emilius,” but it seems doubtful whether he translated this, or only permitted his name to be used.